Jain Religion, one of the oldest religion in the world, has its own significance and is widely known for its non-violence – अहिंसा परमो धर्मं : – live and let live – which has its recognition in the Indian Spiritualism. 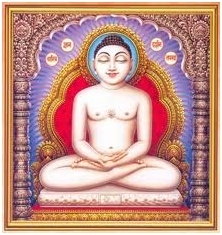 Daslakshan parva– दसलक्षण पर्व is celebrated by the Jain Community for self -purification and upliftment is meant to adhere to the ten universal virtues in practical life and leads us on the right path, far from the mad strife for material prosperity, which ultimately leads us to our destination i.e. salvation . This is the festival through which an attempt is made to put an end to all vices, passions and lustful desires in thought, speech and action. This is the festival in which ten universal virtues like forgiveness, contentment and self-restraint are venerated and worshipped for self -purification. In this festival one mediates upon the inherent virtues of the soul in thought, speech and action or one attains peace of soul i.e. celestial peace .Besides this, in this festival an attempt is made to obtain peace discarding passions and lustful desires through various means and observe harmony in the soul through the study of scriptures. Jain community not only in India but in the whole world celebrates this पर्व annually to subdue all passion and lustful desires. It gives us an expression to the perfectly purified trait of the soul, through which one gets rid of worldly disorders and allurements and one gets fully absorbed in the eternal truth on experiencing and realizing the true nature of soul. In other words, we can say the natural realization of the trio ‘ सत्यम ,शिवम् , सुंदरम ‘ is fully possible only through Das lakshan parva. This festival puts an end to all evils gives us realization of the eternal bliss, and spiritualism becomes alive by the celebration of this festival. When the auspicious month of ‘Bhadrapad’ (भाद्र पद ) comes every year, the whole Jain community celebrates this festival without any difference of high and low, rich and poor. The दिगम्बर and श्वेताम्बर both sects of Jain community celebrates the self uplifting festival with great enthusiasm. During the Bhadrapada—Asvina month i.e. generally in the month of August–September, Jain community observes Das Lakshan Parva, not only in India but also in the whole world. This parva purifies our soul and deeds. It has a great significance and importance in our life. The family members of the Jain community celebrate this parva for ten days. During these ten days from Bhadrapada Shukla Panchami to अनंत चतुर्दशी , Jains observe fast in various forms and give alms (Daan दान ). They leave certain things –Tyag- त्याग ) and observe strictly the principles of the parva. Each day of the parva has its own importance. Dash Lakshan Parva is a festival of ten virtues observed by the Jains for 10 days (This year from September 9th to September18, 2013 ). During these 10 days they strictly observe the following ten dharma as written in Tattvarthdhigama Sutra ch. IX, sloka 6 by Acharya Umaswami. Uttam Kshama Dharma — उत्तम क्षमा धर्मं (Supreme Forgiveness) – To observe tolerance whole-heartedly, shunning anger. Uttam Mardava Dharma — उत्तम मार्दव धर्म (Tenderness or Humility) – To observe the virtue of humility subduing vanity and passions. Uttam Aarjava Dharma — उत्तम आर्जव धर्म (Straight-forwardness or Honesty) – To practice a deceit-free conduct in life by vanquishing the passion of deception. Uttam Shauch Dharma — उत्तम शौच धर्म (Contentment or Purity) – To keep the body, mind and speech pure by discarding greed. Uttam Satya Dharma — उत्तम सत्य धर्म (Truthfulness) – To speak affectionate and just words with a holy intention causing no injury to any living being. Uttam Sanyam Dharma — उत्तम संयम धर्म (Self-restraint) – To defend all living beings with utmost power in a cosmopolitan spirit abstaining from all the pleasures provided by the five senses – touch, taste, smell, sight, and hearing; and the sixth – mind. Uttam Tap Dharma — उत्तम तप धर्म (Penance or Austerities) – To practice austerities putting a check on all worldly allurements. Uttam Tyag Dharma — उत्तम त्याग धर्म (Renunciation) – To give fourfold charities – Ahara (food), Abhaya (fearlessness), Aushadha (medicine), and Shastra Dana (distribution of Holy Scriptures), and to patronize social and religious institutions for self and other uplifts. Uttam Akinchan Dharma —- उत्तम अकिंचन धर्म (Non-attachment) – To enhance faith in the real self as against non-self i.e., material objects; and to discard internal परिग्रह viz. anger and pride; and external परिग्रह viz. accumulation of gold, diamonds, and royal treasures. Uttam Brahmachary Dharma उत्तम ब्रहमचर्य धर्म — (Chastity or celibacy) – To observe the great vow of celibacy; to have devotion for the inner soul and the omniscient Lord; to discard the carnal desires, vulgar fashions, child and old-age marriages, dowry dominated. Jains salute and pray for these virtues. By saluting the virtues, we only receive inspiration for right path, true happiness and total freedom from worldly miseries of life. This is one of the most important festivals of Jain celebrated throughout the world. Its origin is related to the staying of the monks in one place for the rainy season. ” पर्यूषण ” is staying of the monks in one place. In popular terminology this stay is termed “chaturmasa” (चातुर्मास ) because the rainy season is regarded to be about four months. However the minimum duration of Paryushana is regarded to be 70 days. For this minimum duration, Paryushanaa must be initiated by पंचमी . (fifth day) of the शुक्ल पाख of the Bhadrapada month. In the scriptures it is described that Lord Mahavira used to start Paryushana on Bhadrapada शुक्ल पंचमी . In fact daslakshan (ten virtues) Parva or the Festival of ten virtues is the Paryushan festival celebrated by the Digambar Jains annually for self-purification and uplift. This parva ultimately leads us to our true destination i.e., salvation. All digambar jain celebrate this Parva for ten days. It is the festival for the observance of ten universal virtues; viz., forgiveness, contentment, and celibacy, which aim at the uplift of the soul and are vividly preached and practiced during the festival. At the conclusion of the festival, the sravakas ( श्रावक ) request each other for forgiveness for all offenses committed during the last year. In fact, Jainism is a prehistoric religion propounded by the first. तीर्थंकर भगवान् आदिनाथ जी . Upon all these grounds we think that the celebration of Daslaksah parva is holy tradition coming down from the ancient past to the modern times. To sum up this parva is a grand Jain festival of self -introspection, self-realization, self -enlightenment and self -achievement, which ultimately lead to one and only one final goal i.e. liberation or salvation. Das Lakshan Parva is the most suitable occasion for giving donations and charities and on the last day of the festival the house -holders observe full day fast and make every attempt to donate to religious and social installations in cash or kind within their capacity. The festival has its own age-old history, but nothing definite can be said about its origin and since when it is being celebrated. The truth is that spiritual matters like self -purification and renunciation cannot be measured by time scale. Dwarka Parichay Copyright © 2019.